Mail-it-in Friday: Is it ever OK to not score points in the NFL? 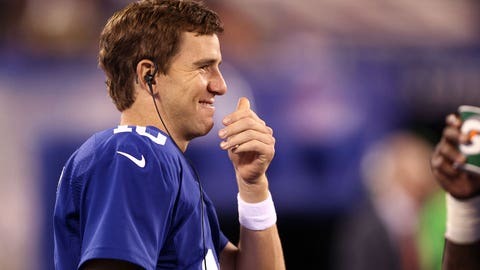 Oh, Eli . . . you trickster. Isn’t this just the best? After an offseason of complete and utter nonsense, we’re finally in the meat-and-potatoes part of the NFL calendar. We have one week of games under our belts and as always, the action was thrilling, attention-grabbing and sometimes controversial. Just how we like it, right? OK, so that being said, here’s the topic for this edition of Mail-it-in Friday: What needs to change in the NFL in Week 2? For those of you who don’t know, New York Giants running back Rashad Jennings spilled the beans on a team secret this week. Apparently, he was told by quarterback Eli Manning to not score on first- and second-down runs late in the fourth quarter of the Giants’ loss to the Cowboys on Sunday night. This is despite having plum field position inside the 10-yard line. The purpose, of course, was to run the clock down as much as possible so that Dallas wouldn’t have a chance to erase New York’s lead with a last-second touchdown. Now, do I agree with this? No, I’d be out there trying to score as much as possible. Wouldn’t you rather have a 10-point lead instead of a six-point advantage late in a game? Who wouldn’t? But even if I agreed with the Giants’ play call in that situation, they completely lost all credibility when they threw the ball on third down. The pass fell incomplete and stopped the clock anyway. So . . . Moral of the story: If you’re going to roll with a bad plan, at least follow it to a logical end. Just like General Custer. Indeed. Although you’re being kind. It would have been fine if Jameis Winston’s debut consisted of mostly "run run pass punt." It was more like "run, fumble, penalty, interception" or "run, run, sack, penalty, punt." That’s not going to win many football games. And it must have been even more embarrasing for Winston to stumble and bumble through his debut while the guy picked right behind him in the draft — Marcus Mariota — was out there on the same field threading the needle and looking like the next coming of Steve Young. Things need to change. Be it shuffling a young offensive line or just simplifying the game plan . . . just put your young quarterback in a position to succeed. Just to clarify, Brandon is a Saints fan. That being said, what the hell happened to the Saints? Another uninspired performance like the one they had in Week 1 against the Cardinals and I’ll be convinced their shoddy 2014 season wasn’t a fluke. And I don’t want to hear any excuses. You have Drew Brees, Sean Payton and Rob Ryan. There’s enough brainpower leading this team to get things on track and it should be somewhat easy with the Bucs coming to the Superdome on Sunday. Then again, the Saints were awful at home in 2014, too. If they gakk a game against a team led by a rookie quarterback, serious changes should probably come down the pike. Head coach Gus Bradley is going to need a higher power to save his job if the Jaguars don’t take a leap forward in 2015. Most head coaches get a few years to turn a program around. Heck, if you’re with the Browns, you might not even get more than one season. Bradley is one game into his third campaign in Jacksonville. He’s not on a short leash . . . but he’s on a leash. Do you think it will be awkward for Kam Chancellor when this whole contract situation gets resolved? Sure, the NFL is a business and no player would fault a teammate for wanting to make as much money as possible. But, then training camp passed. Then the preseason passed. Some grumbling among Kam’s teammates started. That’s Rams tight end Lance Kendrick catching the tying touchdown pass late in the fourth quarter of an eventual Seahawks’ overtime loss. 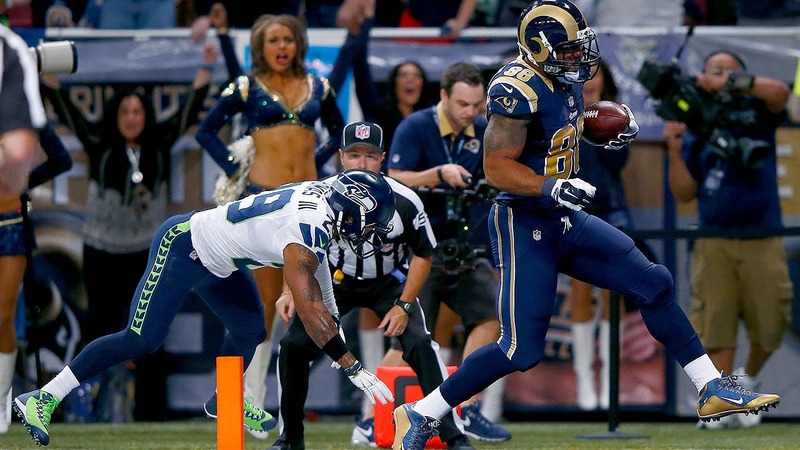 You can see safety Earl Thomas wasn’t able to stop Kendricks from reaching the end zone. But that’s not on Thomas. The man covering Kendricks on the play was Chancellor’s replacement, Dion Bailey — who fell down several yards behind. The asinine people among us could pin the defeat on Chancellor’s absence. After all, it’s hard to imagine someone as talented as Kam falling down with the game on the line. So let’s play pretend for a bit. Kam: "Hey, guys, I’m back!" Kam: "Sorry for not being here for a while. Money problems, you know how that is, right? haha"
Kam: "Ummm, fellas? Why is my locker empty? Why are the contents of said locker in the furthest toilet stall? And furthermore, why are you guys blasting ‘Since You’ve Been Gone’ by Kelly Clarkson?" He’s gonna have to bring in donuts or something to make peace with everyone. Especially if the Seahawks keep losing in his absence. Yes, indeed. The Seahawks are coming to town and one thing they can do very well without Kam Chancellor is run the football. Green Bay was fortunate to play the dumpster fire that is the Chicago Bears on the road in Week 1. Now you’ve got a pissed-off Seattle team coming to Lambeau Field with Marshawn Lynch and — an admittedly older — Fred Jackson. Homefield advantage or not, the Packers need to get themselves in order. Which should be easier against what the previous reader pointed out is a very suspect Seattle offensive line. Yeah, and I need to walk by the booze aisle in the supermarket without picking up a bottle of vodka. But that’s not happening. And neither is your pipe dream. It’s just that easy, right? I’m a big fan of the Eagles at home this week. I don’t think this game will be close at all. I’m taking Philly by two touchdowns in this one. Storm the coast. Secure the beachhead. Gather weapons and ammo. Advance on Cherbourg. Take Paris. I love the military precision in this guy’s tweet. As George Carlin once said: Simple, honest, direct language. @RealSidSaraf @NFLonFOX Win the battle up front. Protect the QB.#FoxMailbag GO EAGLES! No way. Do NOT fire Goodell. In fact, I hope he stays long term. Here’s why: He is the man responsible for changing the PAT rules, which I absolutely love. Do you know there were four missed extra points in Week 1? There were less than 10 in all of 2014. You KNOW this is going to have a giant effect on this season. Somewhere down the road, maybe in a conference championship game or the Super Bowl, everything is going to come down to an extra point. What if the New England Patriots are fighting to hold a six-point lead in the Super Bowl at Levi’s Stadium? What if they allow their opponent — say, the Cowboys — to score a touchdown with just seconds left? What if the Cowboys’ extra-point kick goes wide right thanks to that unstable Bay Area wind? Wouldn’t we all. I had a seat reserved on the Raiders bandwagon this offseason. Turns out I had to get off at the first stop. I don’t respect your opinion, but by God I will fight for the right for you to have it. @NFLonFOX @RealSidSaraf I'd like to see the NFL put the Ravens logo on every team's helmet because I'm tired of looking at these crap teams.